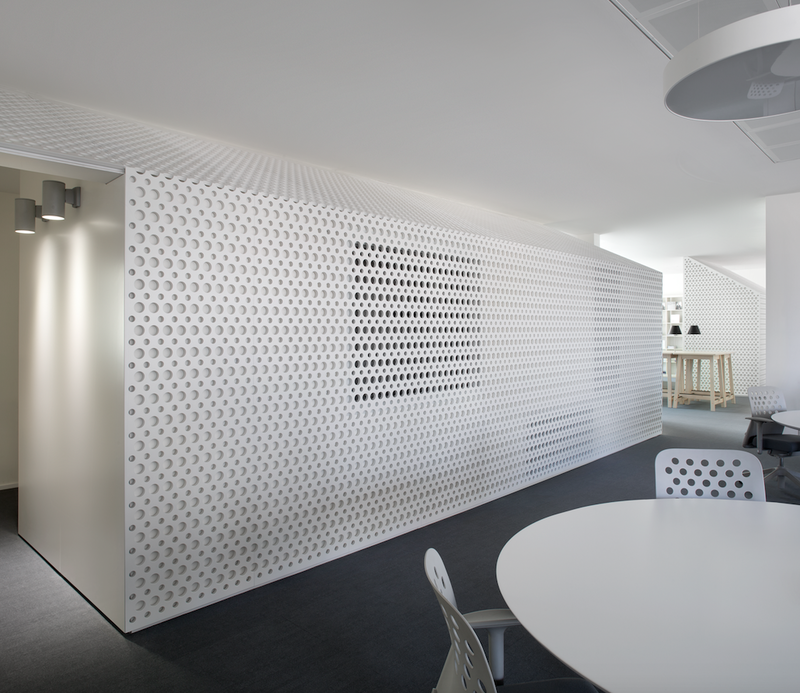 Interpreting changes in ways of working through architecture: this was the aim that DAPStudio successfully achieved. 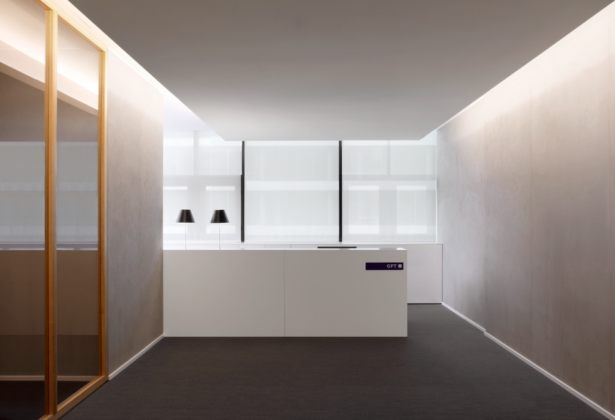 Its starting point was to design the new Milan headquarters of GFT Italia, an IT services provider. 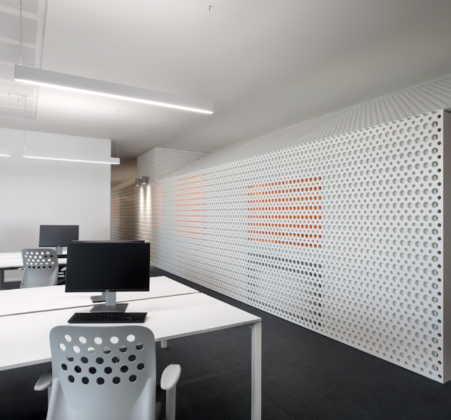 This meant not only translating new, flexible and fluid systems of working into spatial geometry, but also raising the bar to include professionalism - an immaterial concept by definition. GFT is a multinational with a team of 5,500 employees in 11 countries, which develops latest generation IT systems and consultancy to manage the changes in the financial services sector. 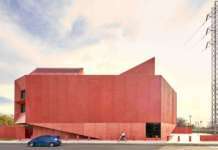 The award-winning DAPStudio (which won the Philippe Rotthier 2011 Prize for the Lonate Ceppino Civic Library and the numerous mentionings under architecture Gold Medal 2015) was created from a partnership between Elena Sacco and Paolo Danelli, who both trained at the Milan Polytechnic Faculty of Architecture and, since 1992, have taken part in competitions and completed design projects on various scales. 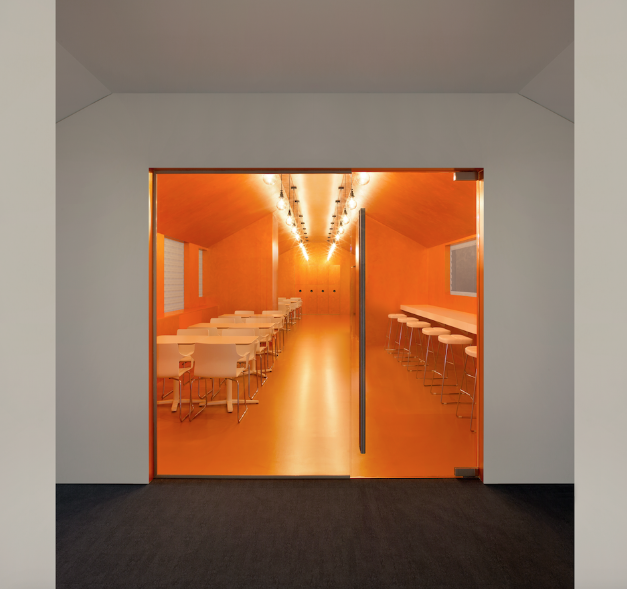 Their direct intervention contains the design philosophy that is the basis of the GFT headquarters project: “we imagined a space where human relations and knowledge move along roads and through squares, where one can discuss privately in welcoming lounges or share opinions at the lunch table. Thus the open space of an ordinary office building becomes a new urban landscape, the scene of a new way of understanding work. Less hierarchy, including in spaces, is embodied in a fluid space that promotes interpersonal relationships and exchange of information”. It is a place that combines two apparently contradictory ideas of space: the offices aim to represent the complexity of a city (in a leap in scale) and, at the same time, create the kind of atmosphere that is found at home. Therefore, the city is a place of partnership and professionalism, a fast-moving system in continual flux, and the home is a space dedicated to comfort and socialising. Specifically, if we look at the details of the design layout, in the centre of the large open-space is a volume that develops longitudinally, recalling the archetypal imagine of a traditional factory. 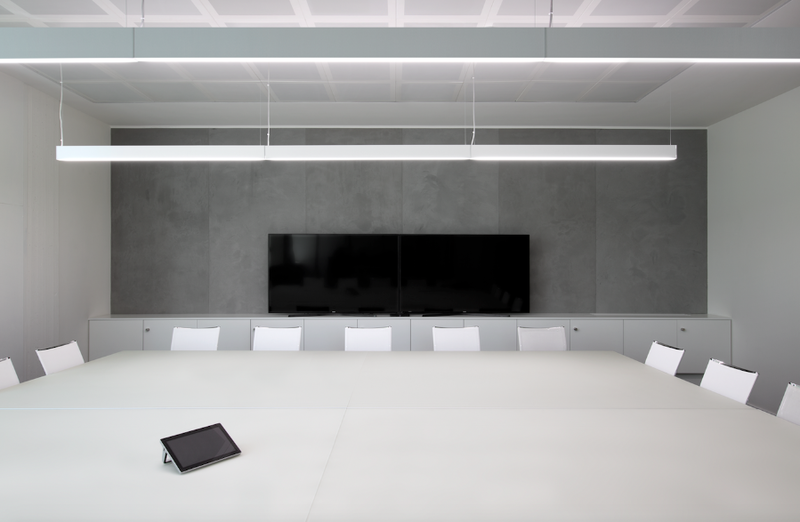 At the sides are the work stations and meeting and conference areas, each of which can be repositioned, thanks to flexible technology and materials, according to need. Inside the volume is a break area and the gabled roof of the central volume is a clear symbol of the idea of home. 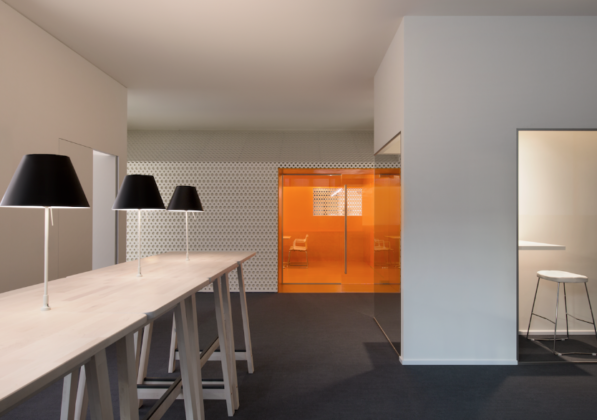 The choice of materials was vital to interpreting the design philosophy through shapes and colours: lacquered surfaces, glass, durmast and MDF feature widely and are used in shades that vary from white to orange, with the warmth of wood alternating with opaque and transparent surfaces, thanks to the versatility of the textures and finishes. 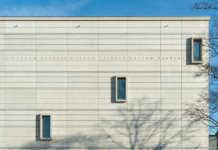 The project’s calling card is the entrance to the new GFT headquarters. Here a large glass wall with wooden sections and doors accompanies the visitor to a matt, lacquered white reception desk and, on the right, a relaxation area. 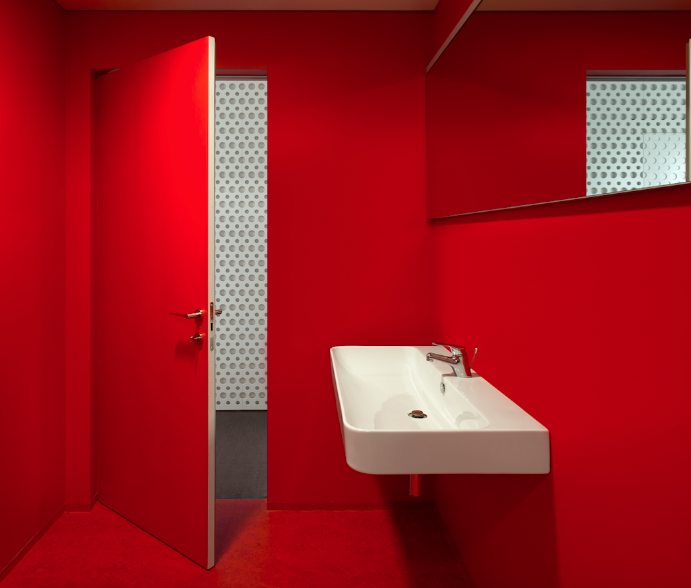 This is followed by a series of multifunctional spaces. 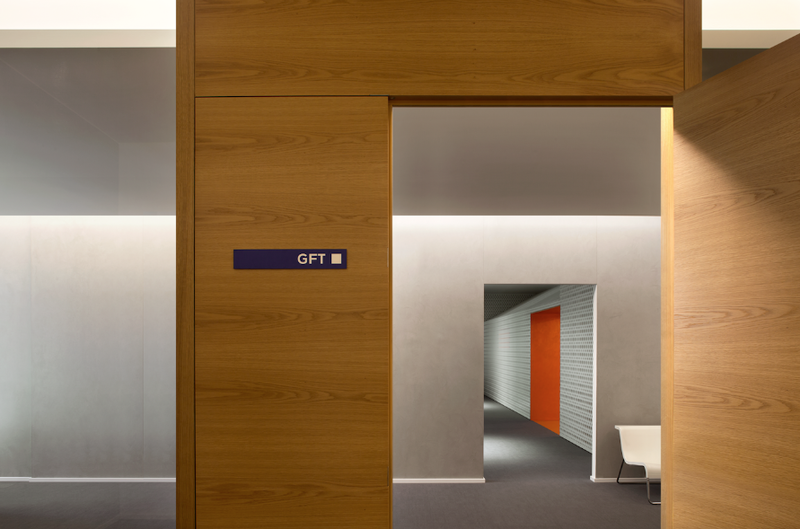 The layout and choice of colours and materials combine to clearly show the response to the client’s requests: an open flexible work space that was also stimulating and lively, in line with GFT Italia’s brand image. 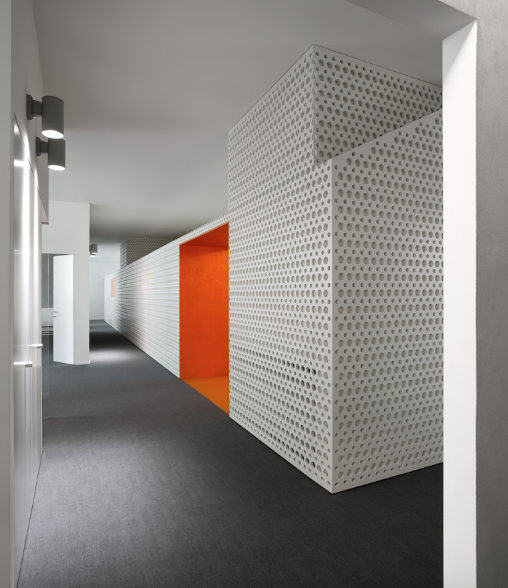 barth Innenausbau created various made -to- measure elements designed by the architects and produced in-house. 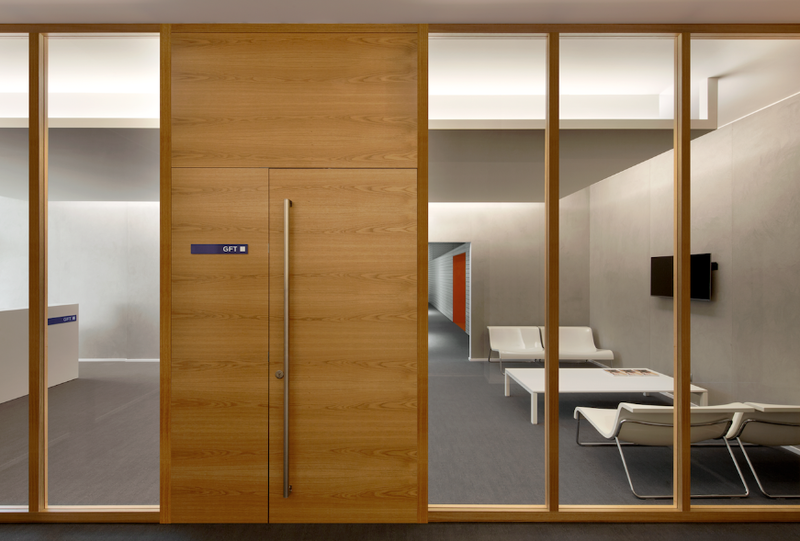 These include lacquered woodwork, the glass panels of the entrance and meeting room, the large reception desk with the furniture behind it and the office furniture, as well as the furnishings for technical equipment, cupboards and shelves. 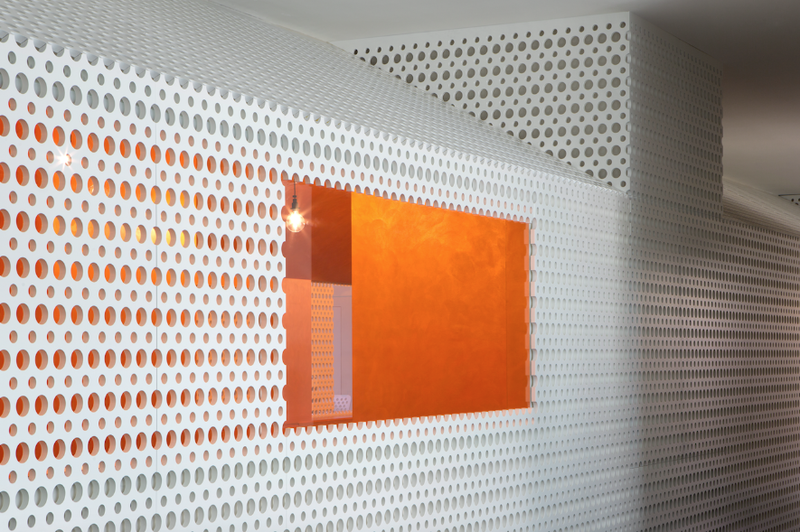 The woodwork is especially interesting: 20 mm thick white opaque lacquered wood has been used to create the original end effect, while the MDF panels were made with holes in two different sizes, to lighten the material nature of the walls and create an attractive interplay of transparency, suggesting the volume’s continual movement. The architects confirm this: “the elongated volume is an architectural element with a dual significance. Its transversal section with a gabled roof echoes the typical architecture of a home and focuses on defining an office that combines with a domestic space (…). However, the longitudinal direction of the volume offers the image of a traditional factory. 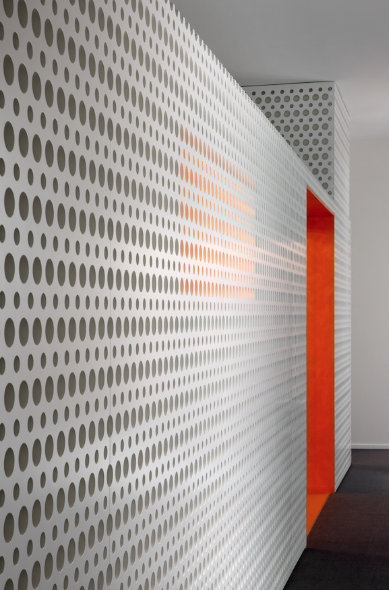 The colourful interior of the ‘factory’ has welcoming spaces and captures the light, thanks to its metal reflections. 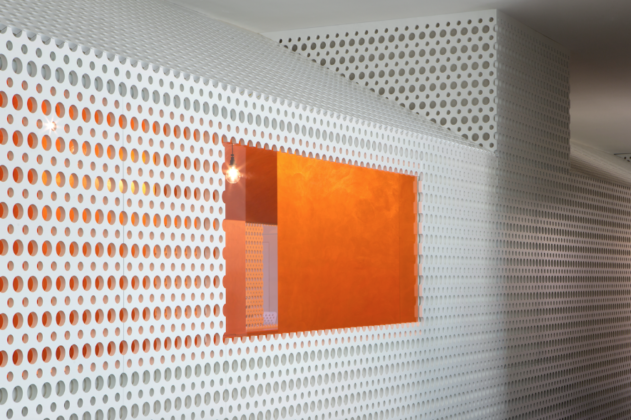 The exterior has a perforated covering that makes the surfaces vibrate in the light, creating a changing perception of the volume according to movement inside the space”. barth also worked closely with the architects on some of the smaller elements, which are no less vital in defining the whole: the phone booths, the glass walls that mark out the meeting rooms and the access to the break area. Every detail has been studied and created to maintain a coherent design and to transform the headquarters into a place of innovation and comfort. The close collaboration between the DAPStudio and Barth Innenausbau, an international company active in the interior furnishings sector for four generations, rooted in artistic woodwork and innovative evolution towards glass and stainless steel workmanship, was essential to achieving the level of excellence required by the project.